Searching for a hard working, entry-level residential controller? X-Core is on the case. Hunter’s popular XC controller is now X-Core. 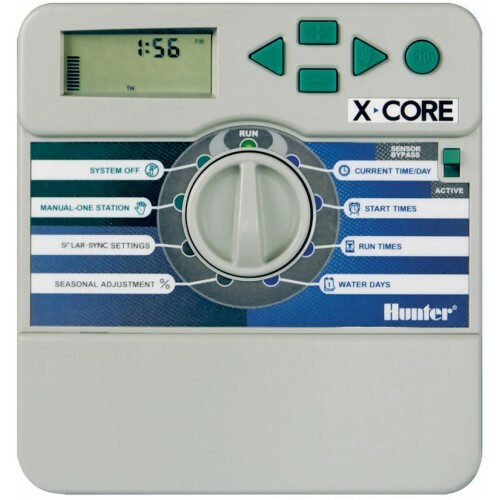 Hunter X-Core takes irrigation control to a new level, which a whole bunch of new features it has everything you'll need and more to water your garden effectively & efficiently. Plug in the revolutionary Solar Sync ET sensor and the X-Core is converted into a Smart controller, using advanced water conservation technology and regulating irrigation runtimes based on locally measured weather. Installation and maintenance are simple with Hunter remote capability, accessible through the optional SmartPort®. Control up to 8 stations with 3 programs and 4 start times each. Case closed, Hunter X-Core has set a new benchmark. Can I get away with placing my indoor controller outside? In rare applications, like on a wall under a well covered patio where the space is 100% dry all the time & not exposed to the sun, an indoor controller will continue to operate without issue. But if you’re not sure, we recommend installing an outdoor model. If something does go wrong with your controller due to water damage or the LCD screen failing from sun exposure, the warranty is voided so it’s not worth the risk. Can I run an irrigation system off a regular garden tap? A garden tap is an excellent place to connect your irrigation system. Ideally, install a connection point behind the tap (turn the water off first) so you can still use your tap to fill a bucket when you need to. Can I run my system manually from the controller? 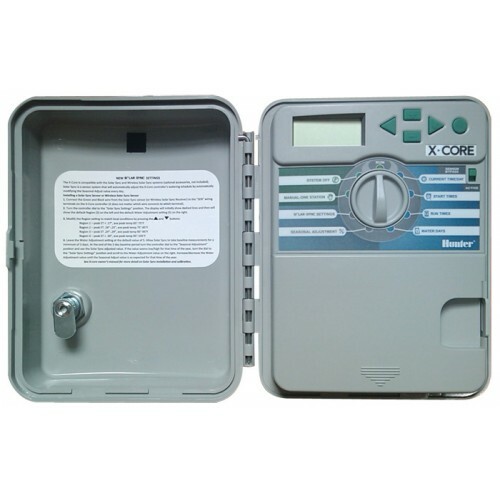 Yes, irrigation controllers typically have a manual function, this will allow you to both operate all zones, or each one individually as you please. Do I need a plumber to install or fix my system? No, unless you’re tapping into your water supply, a plumber isn’t required. Most domestic irrigation systems can be installed by anyone half handy. Do I need a rain sensor? In some states a rain sensor is mandatory, but regardless it’s something you should include in your irrigation system. Having your system turn on in the middle of a day of rain is not only embarrassing, it’s a terrible waste of water & the overwatering is bad for your garden! How long do I need to run my system for? There’s no single answer for any system because of a range of factors. So work with trial and error. If you’ve got no idea, maybe start at 5-10 mins. Then think about watering days depending on the time of year, if it’s summer, everyday, but winter maybe once a week. I want to design & install an irrigation system. Where do I start? Well you’re in the right place! We’ve got it all here. The first step, is drawing out a plan of your garden, to scale of course. We’ve got Grid Paper in our Product Guides & all the advice you’ll need in there too! Will an irrigation controller operate all zones at once, or one at a time? Domestic irrigation controllers will always operate zones one at a time. Even if you try to operate 2 to come on at the same time, the controller will automatically delay the operation of the second zone until after the first zone has finished running. Hunter's new Solar Sync Technology takes weather-based irrigation control to a new level. It's no longer just a matter of shutting off the system when you've had a bit of rain, now it's about efficient, smart watering.It's easy to install & once it is, your Hunter controller will automatically adjust watering for increased water efficie..
Give your irrigation project a kick-start with our Complete Irrigation Manifold Bundles. Don't worry about searching for the right parts, we have selected the very best and you can get it a great value pack price! 4 Zone Bundle Contains: 6 Zone Bundle Contains: 1 x Dura 4 Outlet Manifold 25mm 2 x Dura 3 Outlet .. There's nothing more embarrassing-or more wasteful or costly-than an irrigation system that runs when it doesn't have to...in the rain. Mini-Clik provides the simplest, most effective way to prevent sprinklers from coming on during or after precipitation. It easily installs on any automatic irrigation system, then shuts sprinklers off in a .. This Toro Multi-Core Cable is made especially for use in irrigation with solenoid valves and time clocks. Being multi-core and colour coded, you can wire up multiple valves together and easily remember which wire is connected to which valve.When choosing your cable always remember to allocate a wire for your common wire and we always like t..